GHOST SOLDIERS WOULD LIKE TO THANK MATT FLYNN AND STEPHANIE FOR HOSTING US AT THE MASONIC TEMPLE. 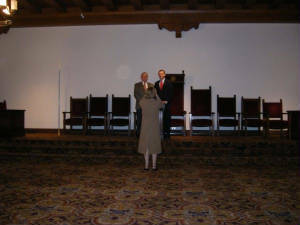 MATT IS A FRIEND OF JIM STEWART, MATT STEWART'S DAD, WHO JOINED US FOR THIS INITIAL RECON OF THE MASONIC TEMPLE. THIS IS AN AMAZING PLACE AND SEEMS TO GO ON FOREVER. ALTHOUGH WE WERE THERE FOR ONLY A FEW HOURS, WE HAD QUITE AN EXPERIENCE! THIS IS A BEAUTIFUL BUILDING DATING BACK TO 1930 WHEN IT FIRST OPENED. IT CELEBRATES ITS 80TH ANNIVERSAY THIS YEAR AND WE SALUTE SCRANTON FOR SAVING SUCH AN IMPORTANT HISTORICAL SITE! The Scranton Cultural Center at the Masonic Temple is housed in one of the most glorious pieces of architecture to be found in Scranton, Pennsylvania. Originally built as the Masonic Temple and Scottish Rite Cathedral, the building is significant as an example of the work of Raymond M. Hood (1881-1934), a prominent architect of the 1920's and early 1930's, and as a unique example of Neo-Gothic architecture in Scranton. Raymond Hood's productive career spanned from 1922, when he and a collaborator won the Chicago Tribune design competition, to his untimely death at 53 in 1934. Hood became a nationally prominent architect trained in the Beaux Arts tradition and proficient with historic styles. During those 12 years, Hood was the principle designer or primary collaborator in a number of high-profile progressive skyscraper designs, mainly in New York City, where he designed the Daily News Building and the McGraw-Hill Building in mid-town Manhattan, and was part of the team that designed Radio City Music Hall. His best known work being Rockafeller Center. The Masonic Temple and Scottish Rite Cathedral is located at 420 North Washington Avenue in downtown Scranton. The 1930 Temple-cathedral is a highly stylized Neo-Gothic and Romanesque pastiche executed by Hood. The design of the building was to be a monument to Masonry. Masonic lodges in Scranton for years felt the need for a suitable home or temple, and prior to the construction of this building they used an old armory. Bids for construction were taken in January, 1927. We have proudly hosted performances that range from Frank Sinatra to Rob Zombie. Our stage has been graced by Yul Brenner in The King and I, George Carlin, NSync and Britney Spears, Barry Manilow, Billy Joel, Willie Nelson, Doc Watson and Bela Fleck. And so many other entertainers it would take pages to include. Today the Center is undergoing a several phased, multi-million dollar restoration. To date work has been done on many areas of the facility. In the mid 1990's new roofs were installed including a complete replacement of the copper roof system and gutters over the south end of the building. Lead paint and asbestos issues were addressed in the late 1990's. Since then all new electric services have been installed, air conditioning was incorporated into the theatre and ballroom. The grand ballroom received major restoration work to the walls and ceilings and the main lobbies are currently being restored. 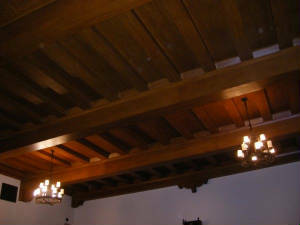 Our most recent renovation was the addition of the Raymond Hood Room in the Lower Level. Future work will include restoration work to the theatre walls and ceiling, new stage lighting and sound reinforcement systems, replacement of the 75 year old stage floor, updated dressing rooms, installation of elevated, portable seating in our 4th floor theatre (Shopland Hall), and air conditioning of our 2nd, 3rd and 4th floor spaces. Matt Stewart, a mason, took these pictures during a recent visit. 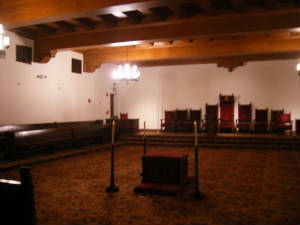 There is an orb in this photo, on the third floor of the temple. IF YOU CLICK ON THIS PICTURE, YOU WILL SEE A LARGE ORB TO THE LEFT(CAMERA LEFT) OF JIM STEWART WITH MATT ON THE RIGHT AND JACKIE, HIS MOM IN FRONT OF THEM. THANKS TO JULIE FOR TAKING THIS PICTURE! FOR DIRECTIONS TO THE SCRANTON CULTURAL CENTER AT THE MASONIC TEMPLE, CLICK ON THE SCRANTON WELCOMES YOU SIGN ABOVE! Please click below to visit our community partners! Don't forget - all Lackawanna County Library Cardholders receive 10% off their ticket purchase.